Dr. Storage Nitrogen Cabinet - Ace Dragon Corp.
As a leading manufacturer of Dr. Storage Nitrogen Cabinet in Taiwan, we provide Dry Cabinet with superior quality. In addition, innovative design, durability, high performance, and low maintenance requirement are the features of our Dry Cabinet, Dry Box, Hygrometer. This smart N2 cabinet is designed to control the filling of dry air into the cabinet, so the desired relative humidity in the cabinet can be reached. The dry air can be nitrogen, CO2 or inert gas. Nitrogen is the most frequently used dry air for a nitrogen cabinet. Traditional nitrogen cabinet allows the N2 to fill all the time. Use Dr. 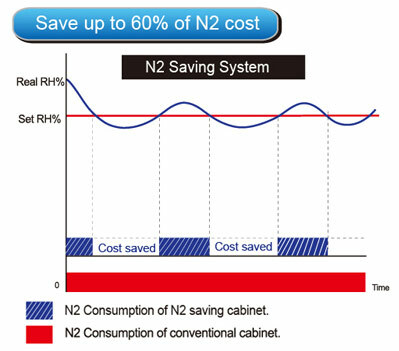 Storage smart nitrogen saving cabinet, 30~60% of N2 consumption can be saved. As a quality centric organization, we follow internationals quality standards throughout our business process. If you have any questions, want to buy in bulk, or have us give you a quote for N2 Controller, Smart N2 Cabinet or Dry Cabinet to fit your needs, please email to us.